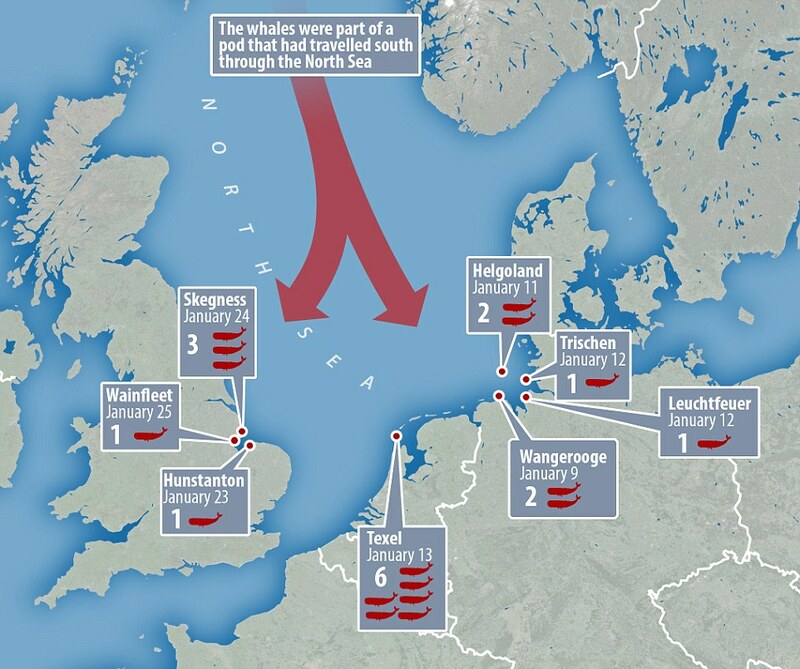 These sperm whales, and three others, beached on the English shores of the Northern Sea; 12 others stranded in Germany and the Netherlands. On one of the whales stranded in England, anti-nuclear activists wrote a slogan to white-wash the wind turbines seen in the background. These whales were apparently members of the same pod, moving as shown above. “Strandings are common in the North Sea but there hasn’t been one on this scale ‘in decades’, according to experts”. It could be that sick or ageing whales would seek refuge in very shallow waters at night, so as to sleep away from orcas (killer whales). Being pelagic species, they would be unaware of tides, and could wake up stranded on the sand. Sane specimens, on the other hand, could beach while fleeing toxic surroundings (water contaminated by chemicals) or other unbearable conditions (noise and infrasound). I remember Greenpeace activists from the old days, who tried to stop the killing of whales. Now they sacrifice the killing of whales “to save the climate”. Something that has concerned us for a long time. At a meeting with a Marine Scotland consultation it was admitted that no research had been done although some was being commissioned at the time. Cart and horses come to mind. Up until then total reliance had been given to marine reports by the wind industry. He who pays the piper calls the tune. Certainly no post construction analysis had been done as the ‘story’ was better than the actual facts. With all the under sea bed cables bringing the power ashore the effect of EMF on the sea mammals is unknown and pretty unquantifiable. Could this explain some of the strandings? EMFs and infra-sound fields make for a deadly cocktail for cetaceans. If the cetacean experts would stop looking the other way, we might get the truth out of them. 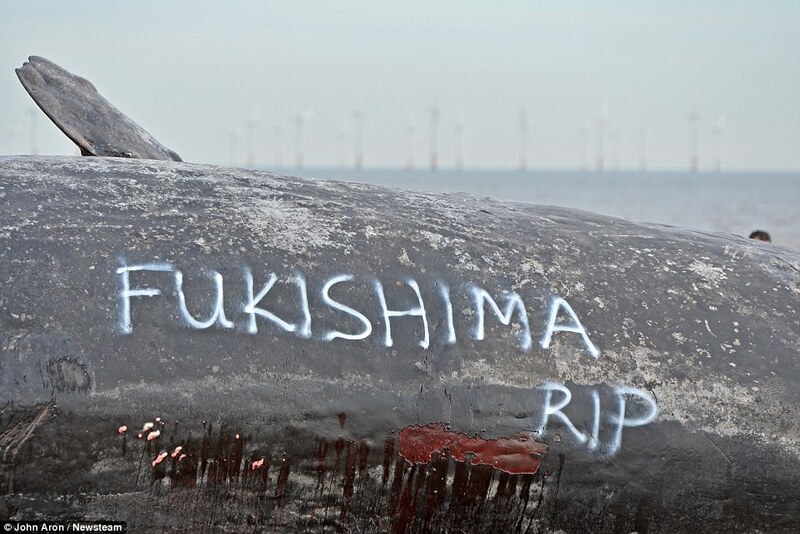 That Fukishima graffiti shows how pathetic the anti-nuclear activists are. Yes, they can’t even spell. 1) the infrasound emitted by offshore wind farms in shallower waters interferes with the ability of whales to communicate and/or navigate with sonar. 2) whales might also suffer adverse health effects from infrasound emitted from offshore wind farms. Water is far more effective for transmitting sound than air because it is a much denser medium. Infrasound is a load of tripe! Peter Signorini is a load of tripe!! Patrick Moore is a very courageous and scientifically well informed person. Get his book, CONFESSIONS OF A GREENPEACE DROPOUT. Work to end the junk energy infestation, just as you worked to inform yourselves of the risk of tobacco dependence. Someone painted Fukushima on the whale, completely ignoring the Offshore Wind Turbines in the background which would emit vibrations that will completely mess with whales sonar…. sir your an idiot… the wind farms have been off shor in the uk for over 15 years with no mass beachings… whats changed recently is russia and the uk are patrolling with submarines in the north sea. its there sonar thats causing the issue with the whales. Wrong. 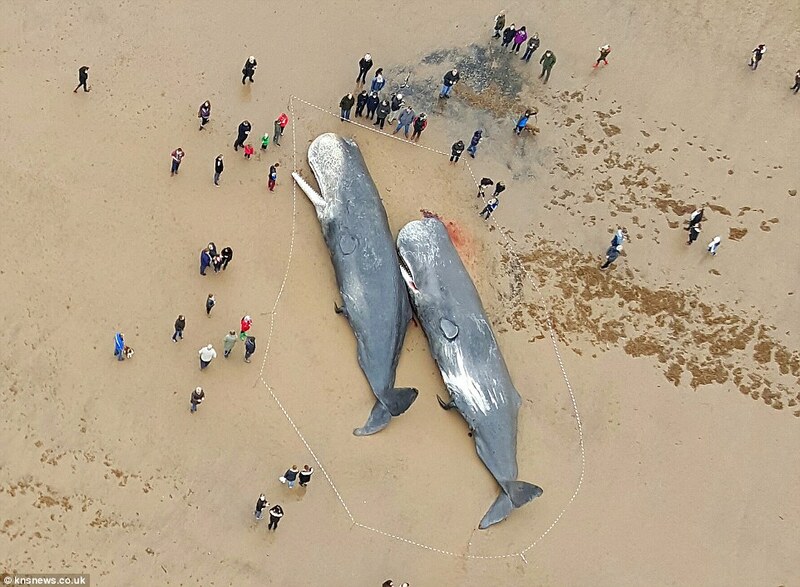 Since the 80s, sperm whale beachings in the UK have increased 7-fold. Do you have any articles backing your claims about submarines active in the North Sea?. Sperm whales are normally not found in that area. They are in the eastern North Sea and Wadden Sea ended because of the changing weather patterns. Sperm whales need depth, they rest vertically and get their food from hundreds of meters deep. The changing climate is to identify previously guilty. Wind turbines blame while it is the fault of the oil and coal industries. The North Sea and the Wadden Sea are both too shallow for sperm to survive. I continue to urge that your work, Dr. Ball, be required reading, EVERYWHERE! My other, longer article on whale strandings was on http://www.SaveTheEaglesInternational.org But the site was destroyed and I am only halfway rebuilding it: about 20 recent articles are still missing, among which the one on whales. Please advise if you need it urgently.